Tie Luo Han (Iron Monk) bushes resemble a willow tree. Tie Luo Han’s thick shiny leaves with large veins create a rich and complex tea. Our Tie Luo Han is roasted over bamboo charcoal so you can appreciate the robust flavor and unique floral aroma. The special character of this tea is its complex and interesting aftertaste. If you are looking for an outstanding rich and complex rock wulong, Tie Luo Han is for you! Guo Bo Cang writes in 1886 about how Tie Luo Han bushes first became popular in making green tea during the Song Dynasty and later as the first of the four famous rock wulongs to become popular in the 17th century. 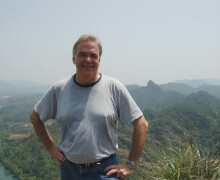 The original Tie Luo Han mother bush was found near Nei Gui Cave, high in the mountains. This bush was given the name Iron Monk to represent monks who developed their spiritual practices in this region. Legends tell stories of these special monks who practiced kung fu everyday in order to guard the temple and to chase thieves away. According to Chinese culture, after you exercise, you drink tea. They would pick tea near the cave after practice, and make tea from the fresh leaves, which tasted especially wonderful during tea season. Tie Luo Han is one of four famous rock wulong teas, grown in Wuyi mountain in the mineral rich soil in the area. Tie Luo Han really represents rock wulong tea’s character. This tea bush was mentioned in the Song Dynasty as being good flavored and having strong branches. 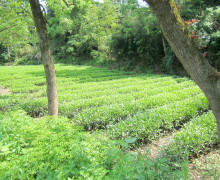 The tea can be picked in early April. The picking standard is “zhong kai mian” which means picking when the last tea leaf opens from the bud and is two thirds the size of the most mature leaves of the new growth. The fresh leaves are carried back to the factory in large bamboo baskets and left to wither in the sunshine for about 2-3 hours. This tea is not made by machine, so the tea master will set the leaves on bamboo trays to naturally oxidize. Every half hour or so, he must shake the tea trays by hand, letting the leaves twist on each other, gently breaking the cells of the surface and edges of the leaves. During this naturally oxidation process, the fresh tea’s aroma will fill up the factory. The tea master will have almost no time to sleep except when the tea pickers are gathering leaves, they must nap instead. They have to carefully stop the oxidation at just the right time, paying close attention to when it is time to stop the oxidation process. Tea makers transfer lightly withered leaves from outside under the sun on to bamboo trays to prepare for the oxidation process inside the factory. Happy and patient monks always make the best tea according to Chinese history. Infusion: First infusion at least 2 minutes. The leaves are good for 4 infusions.